- Held soon after the death of the Buddha around 400 BCE. - Presided by monk Mahakasyapa. - Held by Magadha king Ajatasatru in Rajagriha. - Objective was to preserve the Buddha’s sayings (suttas) and monastic rules (Vinaya). - According to some sources, the Abhidhamma Pitaka, or its matika, was also included. - Also the Sangha made the unanimous decision to keep all the rules of the Vinaya, even the lesser and minor rules. - Held about 100 years after the Buddha’s demise in 383 BC. - Held at Vaisali under the presidentship of Sabakami, convened by King Kalasoka. - Objective was to settle a dispute on Vinaya Pitaka, the code of discipline. The dispute was on 10 Points such as storing salt in horn, eating after midday, eating once and going to villages for alms, eating sour milk after one's meal etc. It was not settles and Buddhism sects appeared for the first time. The subgroups were Sthaviravada, Mahasanghika and Sarvastivada. - Held at Pataliputra under the patronage of King Asoka and under the presidency of Moggaliputta Tissa. - The teachings of Buddha which were under two baskets were now classified in 3 baskets as Abhidhamma Pitaka was established in this council, and they were known as "Tripitaka". - Origin of Theravada school. - In 72AD The Fourth Buddhist Council was held at Kundalvana, Kashmir in 72 AD under the patronage of Kushan king Kanishka and the president of this council was Vasumitra.- This council distinctly divided the Buddhism into 2 sects Mahayan & Hinayan. 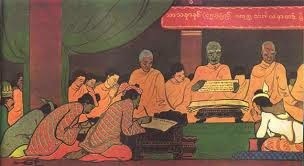 - Fifth Buddhist Council took place in 1871 under the patronage of King Mindon in Mandalay, Burma. - It was presided by Jagarabhivamsa, Narindabhidhaja, and Sumangalasami. - The idea was to recite all the teachings of the Buddha and examine them systematically if any of them was dropped or altered. - In 1954 The Sixth Buddhist Council was held in 1954 in Burma at Kaba Aye, in Yangoon under the patronage of Burmese Government led by Prime Minister U Nu. - Construction of Maha Passana Guha, which is very much similar to India's Sattapanni Cave where the first Buddhist Council had been held, was authorized by the government. - It was aimed to preserve the genuine Dhamma and Vinaya Pitaka.